In which Underwater Scenes (kelp) become a wintry scene! It’s also related to a scene in Winter Wonderland…more trees, more drama, more color. You don’t have to take classes, of course, but I do like to let new subscribers know there’s more indepth teaching available, as well as letting students see a way to apply what they’ve learned. Watch the video below or click HERE to see it in HD on YouTube. This little bear is wearing a plaid scarf (because who wouldn’t, if they were a bear in the woods?) and sitting amid the “Misty Mountains” lesson from Autumn Scenes class. I know it’s a tough background but I haven’t seen many people posting this background! 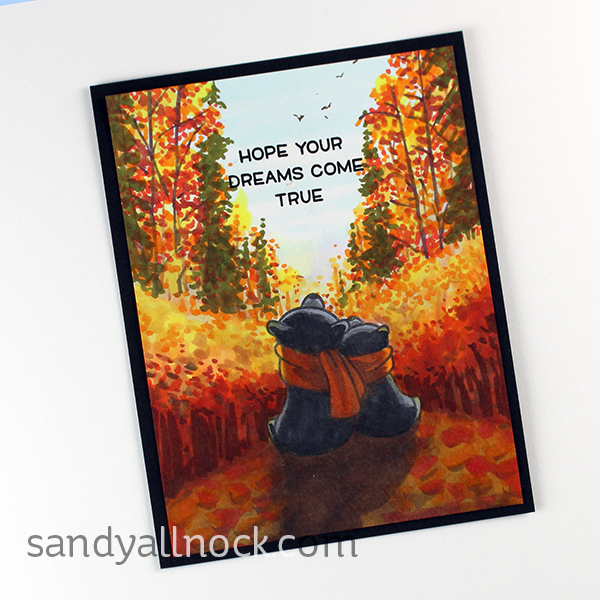 This is a fall-ish version of the winter card, but instead of a road, the black bears are snuggled into a clearing in the forest. And…bird watching. Because bears do that, right? Oh these cards are gorgeous! Your mind must be constantly buzzing with ideas and pictures. I am always amazed by your ideas. Thank you for sharing. These cards are really gorgeous. Do you also have a video tutorial with the fall scenes ? And could you tell me which copics you used for the fall cards? Thank you. 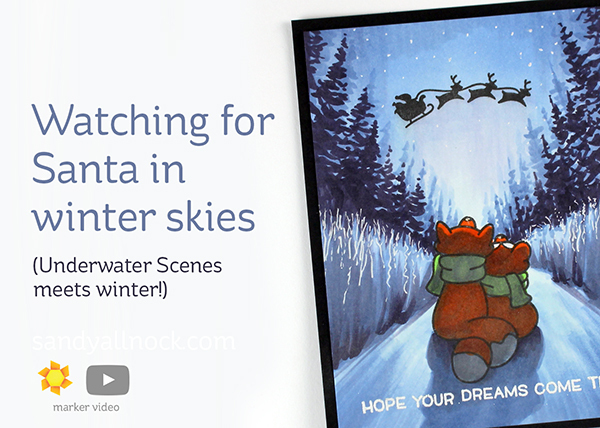 Oh my gosh….the winter scene watching Santa in the sky…unbelievable! Beautiful…now I wish I could color and create like that. Just mind blowing that this is something someone created from stamps and markers. 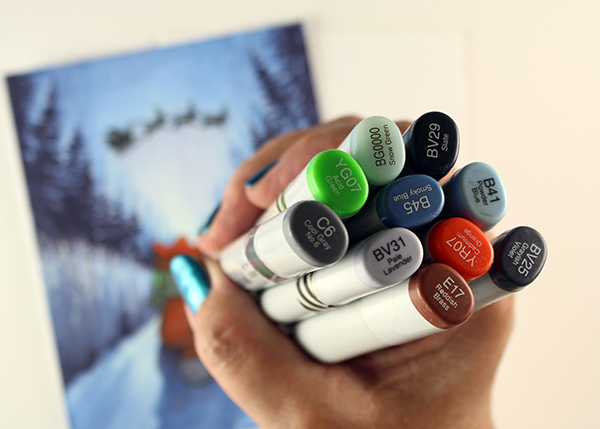 My next big expensive purchase….copic markers! Thank you for showing us your creativity! Oh wow, this card and technique is just amazing! I love the autumn scene cards too. I have this stamp set … I need to finished “Colored Pencil Jump Start” and then take some of your Copic classes! Wow, your cards are just amazing, love watching you create. Thank you for the videos. Oh Sandy, these scenes come right from your vision out of your hands to make scenes of wonder and awe. You teach us in a simple and easy method. Thank you for keeping us moving forward as we can. Much love! Wicked cards ! Gorgeous effects for all those seasons, thank you for this video. Sandy, do you know of any list/ chart that gives comparisons of Copic colours/ numbers to Promarker colours/ numbers at all. I am already to start the Copic jumpstart class ( also run by Sandy folks) but having hard time comparing blobs of colours on screen together, anyone help! I’m dealing with the same problem. I have the full promarker set but miss some essential colours. I’m now working on my own sheet, started a few days ago…. Although I don’t have copic markers, I constantly learn from your videos. What you do is always awesome. When I saw your post comming in on my email I thought the trees where stamps!! Thank you so much Sandy for all your teaching and inspiration. WONDERFUL winter scene! I am thankful for your free videos since I no longer work! Love these. Always like when you use the stamps i already have. The fall ones are so cute. Sandy, you just continue to outdo yourself with these amazing scenes! When first viewed, there is no doubt that this is a “snowy” background – then you start layering in all those dark blues… and miraculously, it still looks like snow! Also, I took the winter scenes and city sidewalks classes last fall, so thank you for continuing to give examples of different ways to use those backgrounds.